Beaver Creek Dry Beneficial Bacteria and Enzyme water treatments are scientifically blended to produce maximum sludge eating and organic reducing results in all ponds and natural water environments. Our Beneficial Bacteria and Enzyme water treatment line will support optimal water quality and vigorous pond-life. It’s perfect for weekly maintenance and providing balanced water environments. Beaver Creek Dry Beneficial Bacteria and Enzymes contains electrolytes, enzymes, and a concentration of pro-biotic microbes that consume built-up sludge, uneaten fish food, fish waste, and excess nutrients. This excess waste all can lead to diseased fish and pond-life. Beaver Creek’s Dry Bacteria and Enzymes completely dissolve and is the most concentrated supplement available in the industry. Our 32 oz. container treats 4000 gallons of water. 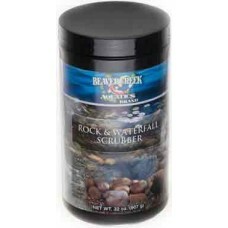 For optimal results with this product ensure the aquarist must maintain a pH of 5.7 – 9.5; a water temperature of at least 48 degrees F, proper water circulation via waterfalls and water features and turn off all UV sterilizers for 24 hours during each treatment. Directions: 1 table spoon per 1000 gallons of pond water. Apply product along the perimeter of the pond and near the return pump and pond skimmer. This allows proper dispersion through the ecosystem. Heaver doses may be needed if extremely poor pond water quality exists or the pond is not properly filtered.